If you want to truly control your muzzle so it doesn’t move at all, you need to have your entire body involved in the process. Starting from your feet and going up, your whole body should be shaped like a horseshoe. Envision your outstretched hands as the top of the horseshoe, your waist the loop and the ground the other side of the horseshoe. This shape allows all the energy to be dissipated throughout your entire body and to the ground, which eliminates pushback. If you want to shoot like a Rock Star, and eliminate muzzle rise, you’ve got to master that shape. Here’s a 10-point breakdown of what you’ll need to get your body alignment just right. Ideally, you should be facing your target and your feet should be nearly parallel with one another. If one foot is back (e.g. you’re walking towards the threat or your dominant side foot is slightly rearward), your head should be over the lead foot. Your feet should be flat, but you should feel pressure on the balls of both feet. Doing so allows you to have instant mobility in your feet, if needed, and is a sign that your entire body position is aggressive and correct. If you’re standing totally erect, you’ll get pushed back a little, even by a 9mm pistol if you’re shooting several rounds quickly. To help eliminate this, either gain a lot of “tactical upper body girth” or get your knees forward (Note: The latter is recommended). Beware of bending too much, though. You want to use bone, tendons and ligaments for strength, not muscles. Muscles fatigue and will shake when you get tired. Which could also translate as stick your glutes back. If you do the opposite of a forward hip thrust (meaning a rearward push), you can help put the largest muscle of your body (your gluteus maximus) in charge. While you don’t want to use muscles, per se, it’s impossible to use no muscles at all, so, you might as well use the strongest muscle you have in the right way, eh? The core of your body is your “chi” area, as it’s referred to in martial arts. This is where your balance or center is found. If you’re getting pushed back when firing, even slightly, leaning in more may be the answer. You shouldn’t cant your body or your head. That’s an unnatural position. No one walks around half-cocked and half-twisted (although there are a lot of half-twisted and half-cocked people). Keeping your shoulders forward and avoiding torso contortion will help align your head and body to the best, most natural, shooting body position. 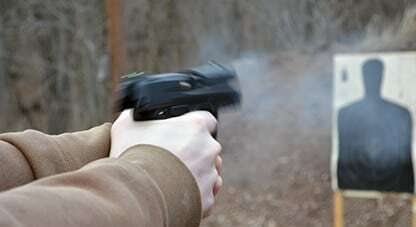 It also allows your arms to get in the right position for better recoil management. The 60/40 percent thing is old school. Punch out with both hands equally. If anything, your support arm should be straight and not the other way around as has been taught for years. Your arms should be locked, rigid and immovable. Obviously, don’t use this technique with a revolver or a really short barrel. You don’t want your finger to get shot or feel the powerful effects of a cylinder-enhanced powder burn. On a pistol, you’ll be fine though. The slide will move, the frame will not. Don’t be scared. Keep your thumb there for solid support. By placing the thumb alongside the frame, and especially locking the wrist in a 45-degree angle, you’ll be set up perfectly for recoil management. Concentrate on the bottom of your thumb—where your thumb and wrist meet. Imagine that you want to press that bone towards your target/threat. That’s the key. Drive that radius bone towards the target. That effectively locks the ligaments and tendons in place and allows for excellent recoil management. With your wrist at a 45-degree angle, it naturally puts your hand in the proper position to control all backwards recoil. In other words, half of your support hand will be under the trigger guard and the lower part of your support hand will be on the top of your strong hand on the grip. Be careful not to wrap your support hand index finger around the front of the trigger guard. That will ruin good recoil. On the other hand, controlling the bottom of the trigger guard and pulling tightly on the grip will stop the gun from jumping upwards and out of your grip. Safety warning: Jeffrey Denning is a long time professional in the art of self-defense and any training methods or information he describes in his articles are intended to be put into practice only by serious shooters with proper training. Please read, but do not attempt anything posted here without first seeking out proper training.